But first, mother lode part two. It didn't take long yesterday to pull out my all time favorite tool, the seam ripper, and begin deconstructing. 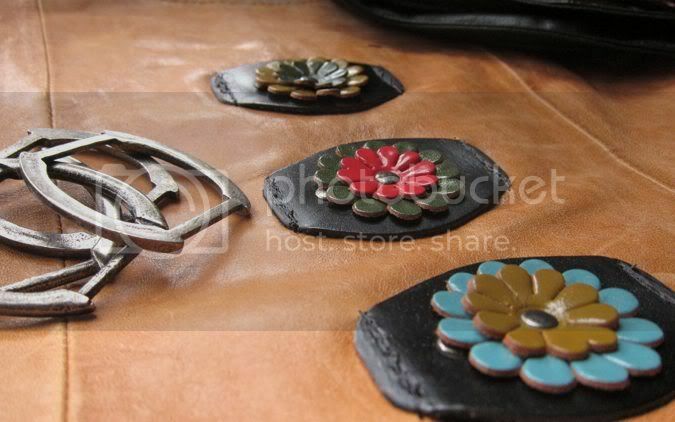 The leather flowers on that belt had me drooling along with the chunky, distressed silver links. Three flowers accent my newest leather bag. 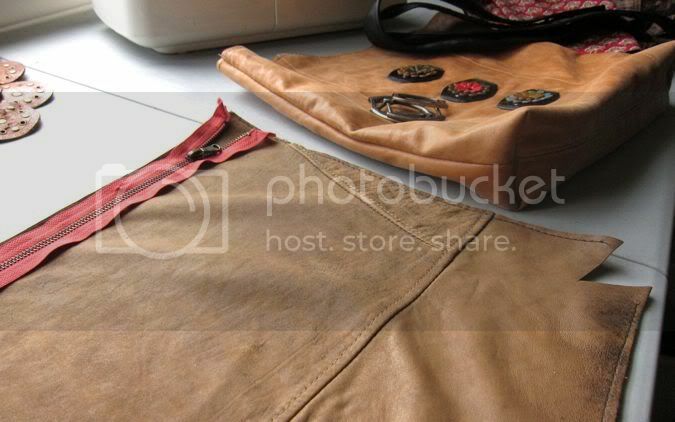 Another bag is being made with one of the distressed leather jackets - sized XXL! I'm serious! It WAS the mother lode and I was in heaven. 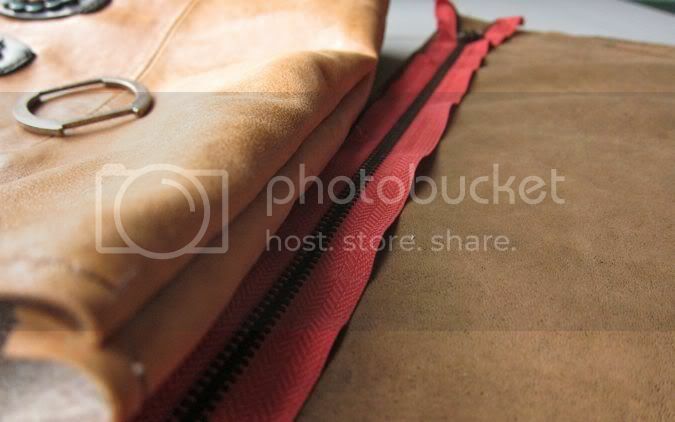 I'm not certain where this bag is headed but I do know that the recycled red zipper fits right in. Everybody loves a pop of red. What with the majority of the east coast under severe tornado warnings today through tomorrow this question begs to be asked. what would you grab as you run to your safe place? Well if I answer honestly just the family and animals - and the animals take a good 5 minutes....in my head provisions so they won't get cranky! Hobby Lobby has some similar ( not quite as awesome as yours ) leather flowers in their jewelry section - I saw them the other day and almost bought them! These look pretty yummy! Yeah Patty wanted to buy the flowers but I bought them all, lol. I would grab my purse, camera, laptop and phone(which are usually all in 1 bag anyway). Am I way to connected or what? Oh and the birth certificates. Camera, laptop, cellphone, and photo albums. 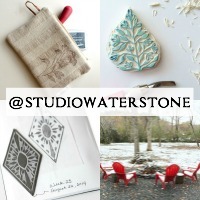 Oh, and count your blessings, it was snowing here today! Yeuch!!! Come on SPRING!! Family and pets. That's it. Oh wait, maybe passports so when the house blows away we can move back to Melbourne, AU, where we never had tornadoes. the printers cabinet is coming with me, and as many beads as I can muster. Oh I shudder at the thought of this. Definitely flashlights - your power is going out for sure. So only hand sewing or deconstruction time. Not so bad! Nothing but my loved ones. But chocolate and wine would not be a bad idea. I was just thinking about this... we have not had the need to hide from tornadoes and we live in a new to us house... I am not sure where the safest place would be? Good to chew on today. And I love that bag that is developing. I am still waiting for 'the one' for me. Off to stalk you now! Love those darned flowers! I would grab pictures. After we got the kids safely to the neighbor's basement last night and the sirens had stopped, I ran back for their pillows and blankets. And I might have grabbed my camera bag with my laptop on the way out the door. probably some pillows and blankets, and water, and snacks, and my glasses, so I could see what's going on. and some comfy clothes. for someone who had to do the same kind of preparing for the round of 2004 hurricanes, I feel ya! Okay, so here's what we did - and we did survive. Yay! Flashlights, batteries, phone charger, phone (charged), candles, matches, comfy clothes, eye glasses, fire safe, kitty carrier (can't lose the kitty - although she was glued to me the ENTIRE time), laptop, moleskin planner, portable hard drive, meds. Mr. Waterstone quickly tired of the whole ordeal and went to his bed. :) Oh, and I verified that his life insurance is paid in full b/c I KNEW he'd ignore everything and go to bed. Sheesh. Okay that last comment isn't true. He did go to bed. I didn't verify the insurance.